Public Transit in Ottawa: Can we have light rail on Bank Street? A little while back, Spacing Ottawa published an op/ed piece by Dwight Williams with a suggested way to link the City of Ottawa's two biggest public construction projects: the redevelopment of Lansdowne Park, which is currently not served by rapid transit, with the construction of an east-west LRT line with a tunnel under downtown. Williams' suggestion? A light-rail transit line that tunnels underneath Bank Street at some points, and parallel to at others. The system map presented above (which you can click to enlarge, and was made with information from Spacing's image) is a rough (and not nearly to scale, I realize) estimation of what this integrated system could look like. 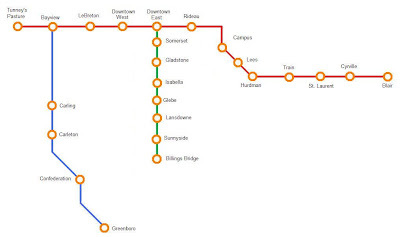 The blue line is the current O-Train, the red line is Ottawa's current east-west line, and the green line is Williams' proposed Bank Street line, which I've made the executive decision to connect to the Downtown East station (which would likely be between Metcalfe and O'Connor streets downtown). 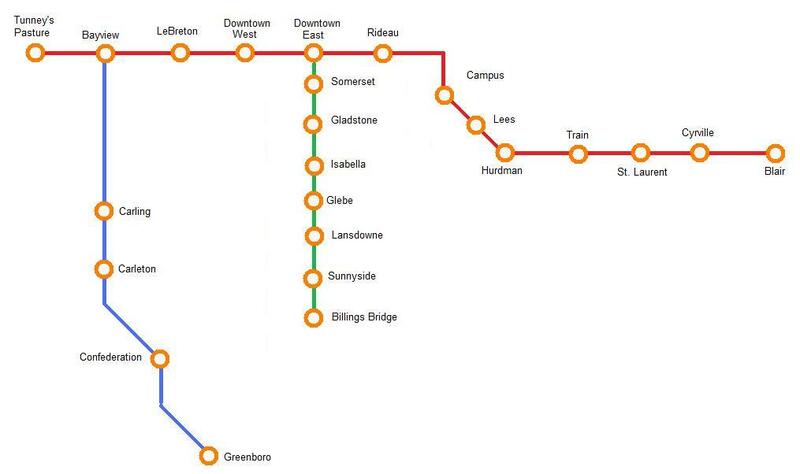 It does connect the "red line" with the "green line" quite nicely, bringing people from downtown to Lansdowne--as well as Billings Bridge, the Glebe, and other destinations--comfortably and quickly. 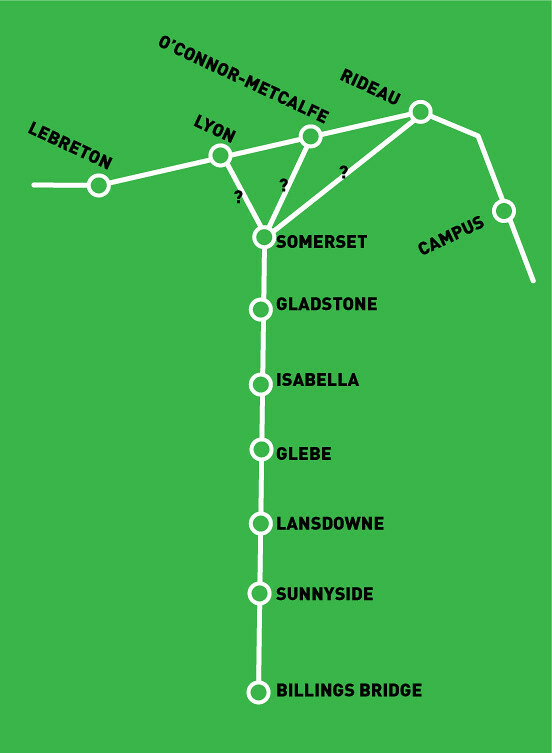 The inclusion of a Sunnyside Station, which would actually be fairly close to the O-Train's Carleton University station, also brings those lines together. As it stands right now, there is nothing of significance, public transit-wise, for Bank Street. In the city's Transportation Master Plan update released in 2008 (.PDF, network map on page 1), a small portion runs along Bank Street near Greenboro Station, but other than that, Bank is reserved for local bus routes, personal automobiles, and human-powered forms of transportation. So, can we have light rail on Bank Street? Well, we probably could, and it would certainly go a long way in solving the transportation problems around the Lansdowne Park redevelopment. But it wouldn't be cheap, and it wouldn't be easy. The cost of tunneling where necessary, and to join up with the Downtown East station, immediately raises questions of cost. Actually building the line would be hard, given that Bank Street is pretty much always busy as it is. And finding the political will to push for this kind of project won't be easy: Since Bank Street isn't really identified as a target zone for rapid transit currently, changing the master plan to put a priority on it would take some real negotiating and gesturing--especially since doing so would likely delay the expansion of light rail further east, west, or south into suburbs like Orleans, Kanata, Barrhaven, and Riverside South. A terrific idea which would most certainly connect Lansdowne to our current and future public transit systems, but not one without significant hurdles to get over. With the recently completed, and presumably planned future, Bank St. improvements, is there room to have a segregated LRT track -- and keep the street open to vehicular traffic? I don't think so. So, what we're talking about here is either a streetcar, which wouldn't really provide any increase in service over buses (although I would argue that permanent transit infrastructure has definite advantages), or an LRT tunnel, right? Sign me up for the latter. Expensive yes, but we need to start looking at transit investments as more than just ways to get suburban commuters into the downtown core. Living in Kanta, I'm not a fan of either the tunnel or the Landsdown project, but my thinking is that if you are going to do both, connecting Landsdown via LRT is a no-brainer. I'm not saying this particular plan is the one, but if you are contemplating regularly moving large numbers of people to and from Landsdown, this is the mechanism to do it. If a tunnel, why does it have to be under Bank for the whole length? One block east, you can do the same to O'Connor, which has the advantage of continuing south into the Glebe, and leads straight into the Landsdowne Park site. Flattered to see the discussion of my idea spreading far and wide like this! As to the suggestion of running it as a surface LRT route along O'Connor or Kent...well, it's certainly an alternative approach worth consideration and debate. My idea is not to run it on the surface on O'Connor or Kent. I stand corrected, then. Your suggestion's still worth debating. I don't know. Is Bank wide enough? How would it effect traffic on the rest of the street. It might not be a horrible idea seeing as how there's a lot of redundant buses running on Bank street. I don't think it would be wise to build it just for Landsdowne though. A stadium like this isn't well-suited to the area. It would be better off in the Bayview yards where there is already the O Train and Transitway. Build the transportation first, then build things like stadiums. I don't think this is a great idea. As for a tunnel? No. Absolutely not. We'd be better off building a tunnel from Westboro to Lincoln Fields. The NCC does not want trains on the Parkway and neither do the residents of the area. It's understandable. A tunnel from Lincoln Fields to Westboro would be a better way of spending our money. I'm glad the idea spawned discussion, even if our councilors ignore it. I am curious about the comment by Anonymous that "there's a lot of redundant buses running on Bank Street." My impression is that the buses on Bank Street are well-used and that any further development on Bank would put strain on transit service. Bank Street has been designated a "transit priority" route in the Transportation Master Plan. I would like to see what exactly that designation means. As far as I know, there has been no implementation plan for any of the routes designated "transit priority". I wish there were redundant buses on Bank Street! OC Transpo is utterly inept at planning the existing routes 1 and 7. The service frequency is never high enough, the two routes are too often "bunched" in the schedule, and there are at times really stupid "holes" in the schedule when neither bus comes for half-hour stretches at a time. There aren't enough runs with artics devoted to them (40-footers can't handle the load, geniuses), and heaven forbid you try and take a bus to or from a big special event at Landsdowne. The thing is Bank would have to grade-separated so the cost alone would make it a non-starter. Other than that it's an alright idea. But it lower on the priority list than finishing the currently planned light rail and maybe building another East-West link on Walkley/Heron. North-South travel while no picnic is usually short distances that are bearable on a bus. East-West distances are longer and should be given more attention first. If Bank Street is the main street that it's marketed as I think LRT would be a great idea. Surface LRT may not releave congestion so I'd be in favour of a tunnel. It seems "tunnel" is a bad word in Ottawa. We need to start thinking generationally. Surface rail may be cheaper today, but if a future council has to revisit the idea of a tunnel because the temporary solution didn't cut it it would actually cost more. On a side note, there are a few comments where people seem to be not supporting the DOTT and Lansdowne because it's not where they live. I live in Orleans and I want LRT in Orleans, but the City has to do what's in the best interest of the City. Not putting a tunnel downtown to releave congestion so us people in the suburbs can be happy would be bad leadership. Having LRT in the suburbs, making us happy, while having a whole bunch of congestion downtown isn't good planning. Kevin, you and I are in agreement on this point. The DOTT ought to be seen as a second phase to what began with the O-Train, and it's my long-term personal hope that LRT - above or below-ground - reaches Orleans, Kanata, and anywhere else that's useful and preferred by our neighbours near and far. Under this proposed plan, you would have two stations on the same street (i.e. Greenboro and Billings Bridge) that are only about 3.5 km apart but yet not connected. This seems extremely inefficient to me. Why not have the additional track from Greenboro north on Bank to Billings Bridge?